Product Use : Comvita Bilberry Caps provides support to normal vision and eye health. Comvita Bilberry Caps provides support to normal vision and eye health. 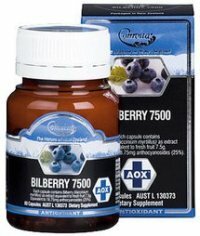 Bilberry 7500 is the latest addition to Comvita's popular Antioxidant Range. During World War II fighter pilots reported improved eyesight after eating bilberry jam. This has sparked studies into the beneficial eye effects of this small purple berry. Scientific studies now back-up its ability to support visual clarity and retinal function. Aging and free radical damage can contribute to certain degenerative conditions of the eye. Bilberry anthocyanidins will provide your eyes with antioxidant protection and vascular support.